Before you can learn to pick locks like a pro and actually earn a living at it you'll need to become familiar with the internal construction of basic types of locks. You'll need to know how a particular lock is designed so you can visualize what's happening inside the lock while you're picking it. Locksmithing, like any other trade has it's own industry specific vocabulary. You'll find an extensive dictionary on this website that you can refer to with all of the locksmith "lingo" you'll need as you progress through these pages. Most commonly used residential and basic consumer locks are referred to by a generic, non-brand specific name such as bike lock, automobile lock, deadbolt lock, cabinet door lock, key-in-knob lock, deadbolt lock, padlock or combination padlock, sliding door (patio) lock. The key-in-knob lock refers to the type of lock that is operated by inserting a key into it's knob, like the front door to your home or apartment or office. A deadbolt lock projects a deadbolt by external force. As you can see many locks are named and referred to by the purpose of the lock. There are some lock manufacturers that are so well known in the industry that their locks are referred to by the manufacturers name. This is especially true when the locks all share common traits or characteristics. These locks share the same internal construction. Medeco Security Locks, Inc is a good example. There are a handful of brand names (lock manufacturers) that every locksmith needs to be familiar with because of their popularity. Those manufacturers include Medeco, Master, Arrow, Best, Schlage, Weiser, Yale, Corbin, Russwin, Kwikset, Dexter and Ilco Unican. 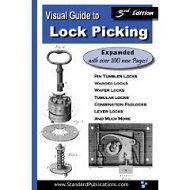 It's a good idea to pick up used or old locks from each of these manufacturers to practice your picking skills on since they are the locks you'll be running into each day. Beginning locksmiths and students of the trade will need all kinds of locks to take apart, examine, repair and salvage for parts. You'll find used and second hand locks from junk yards, garage and yard sales, salvage yards, and pawn shops.